Disclaimer: Didn't create the Seven. Don't own them. Never will. 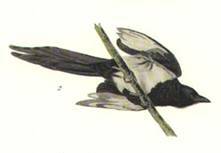 Didn’t draw the magpies either – those are Audubon’s – and the photos and drawings that I spirited off the net aren’t mine either. No profit made, no infringement intended. Parts: Twenty-Four, though what does that mean, right? In Word, TNR, 11 pt font, its about 85 pages. Notes: This was partly inspired primarily by the rhyme. My mother taught to me when I was little, and her mother to her, and her mother to her, and so on. I’ve wanted to write a story about magpies for years. There are other versions, some longer, but I believe this one is the most well known. -- ancient superstitious rhyme that, as far as I know, has been around forever. And for fun, I found out some neat things when looking for pictures. Magpies, which span at least three continents (Europe, Asia and North America), are generally considered the cleverest of all birds. Whether justified or not, they certainly have been documented to show more curiosity and ingenuity than any other bird, including the use of tools and looking under things for no reason except to see what is there (perhaps looking for hiding holes). These qualities have made them popular in many folklores. In Europe they are, by reputation, thieves. In England in particular, coming across one can be both unlucky and lucky, depending on how many you see at a time (hence the poem) and how you greet them. In ancient Greece, the bird was associated with Bacchus, and, thus, drinking and greed. In Cyprus, they are jokers – comic relief. In Chinese folklore, the Magpie is the bird of happiness or joy. In Korea, it is the bearer of good news. In Sweden, it is popular to know the value of putting “Salt on a Magpie’s Tail”, while in neighboring Norway, crazy Loki and the smart Magpie were good friends. 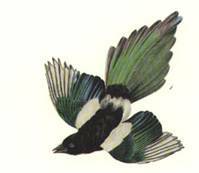 And in America, certain Native American tribes celebrate the magpie as the most intelligent and helpful of all birds, who contributed to the origins of the Buffalo Dance when helping the Hunter’s Daughter save her father. In other words…very cool birds. And all I really wanted to do was use my mother’s favorite superstition -- counting magpies – where you always hope to see seven in one go…. Description: An Opera Singer decides to make an unusual stop on her cross country tour -- Four Corners -- but when her prize emerald brooch is stolen, it starts a chain of events that sends JD up a tree, Ezra into hell, and Chris fighting not to lose one of his men.